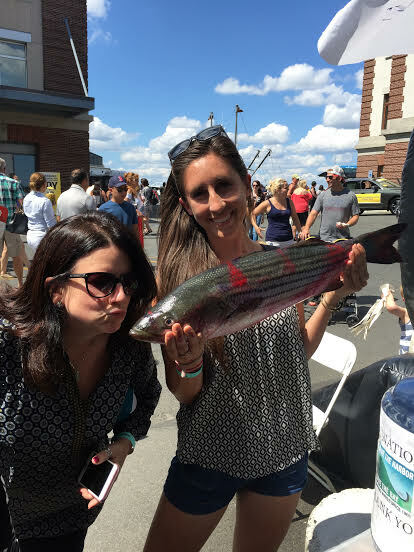 Holding the bass at the Seafood Festival, no fish kisses mom! This weekend was one I had been waiting for for a long time! On Sunday, August 13th, the Fish Pier served as the location for the Boston Seafood Festival. 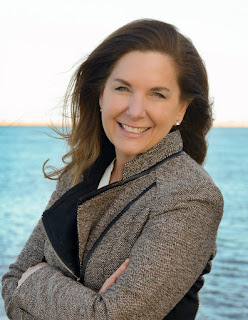 My mother was visiting from California and I knew this was an excellent opportunity for her to see Save the Harbor in action and enjoy some amazing seafood. Once we entered the festival, our first stop was the Save the Harbor tent. Our tent was filled with everything needed for fish printing! My coworkers were hard at work helping children paint a flounder as well as a large bass. Colorful prints hung from the top of the tent showing just how popular this activity had been throughout the day. My mother and I worked together on a print of the flounder as I explained to her all of the cool flounder fact I learned while working here. My mom was even able to meet Tony the pirate and here a few harrowing tales from the sea. Of course, we did not miss out on the delicious food at the festival. I enjoyed a sushi burrito while my mom ate a few shrimp tacos. This event superseded my expectations and I was proud to show off all the neat things Save the Harbor is a part of. On Monday, all of the staff at Save the Harbor enjoyed staff day on Lovell's Island. I had never been to this island before and was eager to cross another one of my list. Unlike Spectacle Island, Lovell's Island was thickly forested and the walking paths were lined with delicious blackberry bushes. As we walked across the island, we all plucked a few berries to snack on. We started our day by tidepooling; one of my favorite activities! As an avid tidepooler in California, I was very interested to see what I would find in these East Coast tidepools. Once we all scattered around the large rocky shore, we began to find interesting critters. Patrice flipped over a large rock and revealed a plethora of life beneath it. 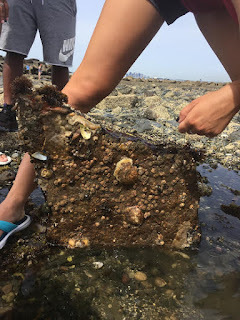 There were bryozoa, tunicates, crabs, barnacles, and sponges. We found crabs of all shapes, sizes, and stages of molting. At one point, I found a tube made of small pieces of sand and shells and I knew it must have belonged to some sort of sea worm. I referred to my guide book and discovered that it in fact belonged to an Ice Cream Cone Worm, one I have never encountered before. After we completed our tidepool adventures, we learned about types of snails on the island and hypothesized about the fate of some snails that had been found under a tree. We scoured the island in search of possible tree snails and clues that would enlighten us on a snails life on the island. Lovell's Island was interesting indeed was a great new experience to add to my time here in Boston. Hopefully I will get to check out at least one more island while I am here.